Dressing right for the occasion—it’s important when you’re scaling a serious mountain and/or scanning Runyon for Charlize Theron. Herewith, a useful guide to having the right shirt or high-tech backpack for the varying levels of LA hiking. 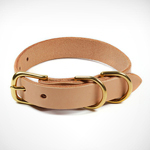 Your odds of making contact with some fetching, dues-paying SAG member aren’t exactly lowered with the companionship of a dog—who wouldn’t exactly look worse with Tanner Goods’ classic English bridle leather collar. You’re getting up early enough to watch the sunrise. And getting back just in time to assume a laptop at LA Mill. 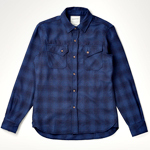 This wool flannel made by Woodlands will fit in seamlessly at both. They just reopened the Hollywood sign trail over here. 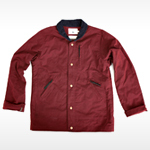 If you still happen to have some Bostonian refugees at your place, put on the handsome, multi-pocketed waxed-nylon trail coat from AXS Folk Technology while claiming you’re “still kind of cold.” Just to mess with everyone. You’re high in the mountains. And weird, there’s weather. Of the coldest, whitest variety. 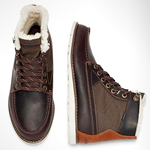 Better hope your feet have been stuck in these sturdy Swedish chocolate field boots lined with intense softness. May lead to thinking about Swedish chocolate. Seven miles straight up. Hats off. But please bring water. 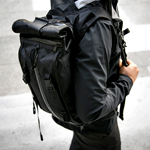 Like enough to fill this weatherproof, high-tech hydration backpack from Mission Workshop. It carries three liters of water. According to the metric system, that’s probably a lot.